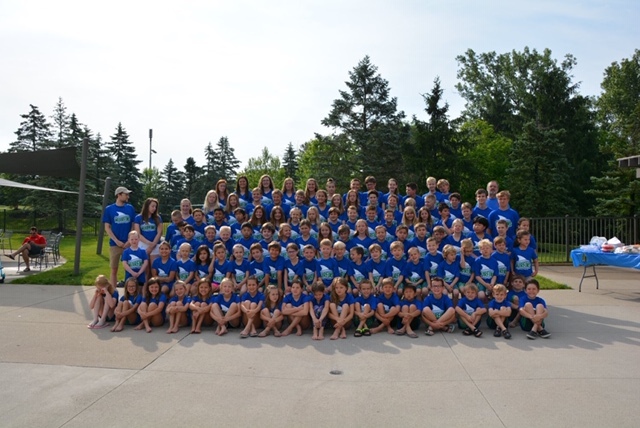 The Muirfins Swim Team is the community swim team for families who live in Muirfield Village. Our mission is to get Muirfield kids off the couch or screen they're glued to and outside for some good, healthy summer fun and competition! We accept kids ages 5 - 18. There are no try-outs - we will work with all levels of swimmers (as long as the child can swim one length of the pool unassisted). Our team is 140+ kids and growing! The swimmers practice Monday - Friday during the season and compete in meets each Wednesday night. Our season runs May 28th - July 17th. The Fins are part of the NEW League with 9 other local teams; Dublin Dolphins Arctic, Dublin Dolphins Atlantic, Dublin Dolphins Pacific, Marysville Stingrays, Northland Tiger Sharks, Lifetime Fitness, Olentangy Tornadoes, Plain City Sharks and Sycamore Hills Swim Club. The Muirfins head coaches are Alex Thomas and Jordan Gundlach. Sign-ups for the summer season begin online around early April. Visit the Muirfins website to learn more at www.muirfins.com or email Muirfins President Amy Weeks at [email protected]ail.com.